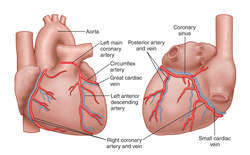 Either of two arteries that originate in the aorta and supply blood to the muscular tissue of the heart. one of a pair of arteries that branch from the aorta, including the left and the right coronary arteries. Because these vessels and their branches supply the heart, any dysfunction or disease that affects them can cause serious, sometimes fatal complications. Coronary arterial anastomoses occur throughout the heart and are especially numerous within the interventricular and interatrial septa, at the apex of the heart, at the crux, over the anterior surface of the right ventricle, and between the sinus-node artery and the other atrial arteries. These anastomoses are more numerous and larger in the epicardium than in the endocardium, and they provide important collateral circulation in the recovery of patients who suffer coronary occlusions. The branches of the coronary arteries are affected by many different disorders, such as embolic, neoplastic, inflammatory, and noninflammatory diseases. The artery that supplies blood to the heart muscle itself. KEY WORDS: Interleukin-6, -174G>C, -572G>C, -597G>A, Polymorphism, Coronary artery disease. 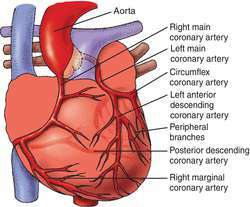 8) Normally, right coronary artery arises from right aortic sinus and the left from left aortic sinus. The patient was counseled and was subsequently discharged in a very stable state, without any further therapy for the coronary artery anomaly. On CT images performed with a proper coronary artery protocol the exact location diameter lumen and relationship with adjacent structures can be assessed as compared to conventional angiography where only the lumen and intimal wall assessment can be assessed. Clinical findings alone are not sufficient in the diagnosis of anomalous origin of the left coronary artery from the pulmonary artery. Sudden death and myocardial infarction after exercise have been reported in patients whose left main or right coronary artery goes between main pulmonary artery and aorta (7). As a preventive step among those who had already developed coronary artery disease, stopping smoking accounted for a 4 percent decline in the number of deaths and the improvement in lipoprotein levels accounted for 18 percent. Hence the most common coronary artery anomaly in our study was myocardial bridging which is a type of anomaly of intrinsic coronary arterial anatomy. Left main disease is a high-risk subset of coronary artery disease involving blockage of the left main coronary artery, which branches off the aorta to provide blood flow to the left ventricle of the heart. The patients, average age 62, all entered the study with a coronary artery more than half blocked, and many had chest pain. When first introduced, angioplasty represented a major step forward in the treatment of coronary artery disease.